This beautiful 132-page color book explores how food tells a story about Union Square, Somerville. We think the square is a very special neighborhood right now; it is diverse, artsy, yet has enough grit to keep things interesting. This is illustrated through the food landscape, with its beautiful, motley mix of pizza joints, mom-and-pop markets, lively pubs, farmers’ markets, posh new restaurants and brimming global flavor. This book aims to capture this dynamic—and delicious—sense of place. 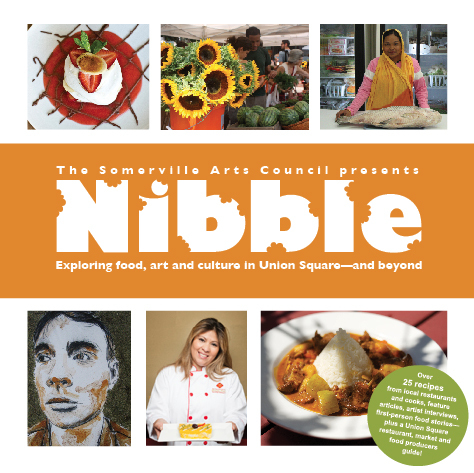 The Nibble book costs $15; all proceeds support the public programs of the Somerville Arts Council. Click on the Donate button below and get your Nibble book today! Pick up your book at either our office or these fine store below. —Over 25 recipes from the folks at Taza, Casa B, Hightland Kitchen, the list goes on—and fabulous cooks, including the Mayor Joseph Curtatone’s mom, Maria! —Plus, a Union Square restaurant, market and food producers guide!